Product #15939 | SKU IPHONE-MIC-1 | 0.0 (no ratings yet) Thanks for your rating! This 30 cm TRRS to XLR Microphone & 3.5mm Monitoring Jack Cable from Sescom lets you connect a professional XLR microphone to your iPhone, iPod, iPad, or Blackberry and take advantage of the many apps designed for audio recording on a Smartphone. 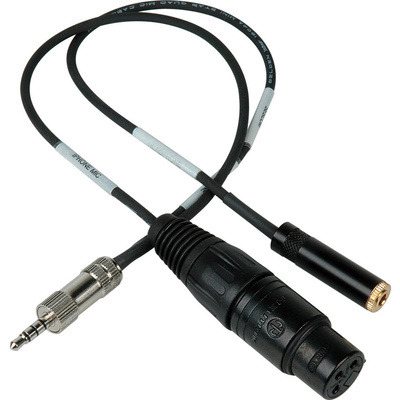 This well-built cable features phantom power blocking and impedance matching components. The cable also provides a headphone monitoring tap for critical applications like field reporting and assignments for news gathering professionals.